Because of the proprietary system, it takes more work to move a website from SBI than moving a site between conventional web hosts. This article does not address the pros and cons of moving your site. It’s a brief overview to help you understand what steps to take once you decide to move. Here are some tips to help you make the move with a minimum of downtime and frustration. The most important tip I can give you is to build your new site at the new host BEFORE you change your nameservers at SBI or transfer your domain name. If you don’t, your site will suffer downtime while you learn how to use the new hosting and site building platform. No matter what site format you choose (regular HTML site or WordPress), there is a learning curve. I can’t stress this enough. It took you time to learn how to use Site Central, it is going to take time to learn your new host’s dashboard AND if you select WordPress, time to learn that, too. Depending on the size of your SBI site and how many of the proprietary tools you use, it can take weeks or months to move your content to WordPress. So the decision to move your site is best made with a clear head. Don’t just yank your domain name away and then try to figure out what you are going to do. Your site could end up being down for months, and if you don’t have a backup, you could even lose your whole website. The first big decision you need to make is whether you want your website to remain an HTML site or change it over to WordPress. There is some misinformation about WordPress floating around the SBI forums. You can completely reproduce your SBI site in WordPress before the domain name is transferred, including keeping your file names with the .html extension. Some people are concerned about combining a site move with converting it to WordPress at the same time. It is safe. Google won’t penalize you for doing both at the same time. Just make sure to test your pages for errors before going live. A new site full of errors won’t make a very good impression on the search engines OR your visitors. Also, if you change any page names or the domain name, make sure to create 301 redirects so you don’t lose traffic to the new pages or website. Once you decide on a platform, you are ready to begin preparing for your move. Here are the steps I recommend to minimize risk, headaches, and downtime. Remember, this is a brief overview, not step-by-step details on how to do a complete move. Note: Moving your SBI site to WordPress can be a long, involved process. These steps are an overview, not detailed instructions on how to complete each step. Research then select an HTML template or WP theme. If you like your SBI site the way it is and want to stick with HTML, it can moved as is with some code changes using the transitional template. Before buying a theme or template, read the reviews. Do people complain about code errors or lack of updates and support? If so, skip it and find something else. If you want a WordPress site, make sure the theme you select allows the type of customization you want. For instance, can you create a custom header or menu? Can you change the colors or fonts? And if it allows customization, do you have to alter CSS or PHP code to do it, or can you customize it through the Dashboard? My favorite theme is the Genesis Framework which is the theme I used to redesign my site. Genesis is an excellent theme from a reputable company but it does require CSS to alter the look and feel. Want to get the Genesis Framework for free? Order my WordPress installation package. One theme family that I’ve become familiar with while working on client sites is Elegant Themes. You can customize quite a bit in the dashboard without using CSS. The Divi2 theme is especially popular. Selecting a web host is a very important step. You want to choose one where you will be comfortable for a long time. Don’t just go for who is offering the cheapest deal at the moment. Most web hosts have shared, virtual private, and dedicated hosting packages, as well as a variety of add on options. It can be pretty confusing if you’ve only used SBI where you don’t have to make that kind of decision. Many people ask what I recommend. I used GoDaddy and HostGator as well as many other hosting providers over the years. However, I recommend Siteground for shared hosting. In the past when I hosted my site there, I was been very happy with their services. Many of my clients host on SiteGround and they continue to impress me with their service and being on the front line of innovation. Sites run faster on SiteGround than on cheaper hosts and their support it top-notch. If you can afford it, choose the GoGeek plan to get upgraded hardware and fewer accounts per server. If you are looking for a cheap host, I like InMotion. Their service and support isn’t as good as SiteGround, but they are still a decent low-cost host. Many web hosts use the cPanel system. This is the preferred system because you can move a site from cPanel host to cPanel host using backup and restore. You can even move your cpanel email. You can expect to pay about $100 a year or more for cheap hosting, $300 or more for business-grade hosting. If you compare that to SBI, you may think that’s expensive. The savings come in when you host more than one site on your account, which is possible with most conventional hosting packages. At SBI, if you have two sites, you pay double, triple with three sites, and so on. I’ve compared the costs and found that if you are moving sites because of finances, you will not see much of a savings moving just one site unless you do not add any third-party software, such as tools for publishing your ezine or doing keyword research. What domain name should I use on the new host? Set up email at the new web host – don’t skip this step! Your email will not work until the nameservers are changed, but set it up beforehand so you don’t have interruptions in email service. This is especially important if you are using Google Apps for your email. Most web hosts allow you to create email addresses for addon domains. It can take a while to recreate your site on your new host. During that time, you need somewhere to build your new pages. If you are not using your SBI domain as the main domain on your hosting account, this is done by creating an Addon domain using your SBI URL. (Every host is different, but on SiteGround, this is done through the cPanel.) This creates a sub-folder for your new site and allows you to upload and test the content before you transfer the domain. If that process seems too difficult, you can contact your new host’s technical support and ask them to create a temporary URL for you or build your site on an alternate domain. Note: Many hosts are no longer allowing temporary URLs because they can be a security risk for their servers. Some webhosting companies offer a sandbox environment for development. Contact their tech support and ask what is available. If you are creating an HTML site, use FTP or the host’s file manager to upload pages as they are finished. Tip: If you are worried about the search engines spidering the new site before it is finished, password protect the folder where your new pages are located. Or in WordPress, go to Settings > Reading then select Discourage search engines from indexing this site. If you are using WordPress, you will have to copy and paste your content page-by-page. The first few pages take a long time, but you will soon figure out what you’re doing and it will get faster. 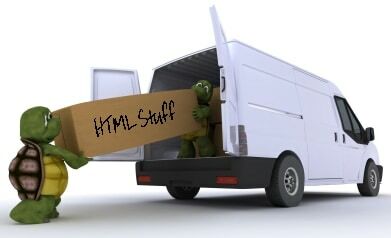 I offer a BB1/BB2/HTML to WordPress site move service if you don’t want to convert your pages yourself. You can get a list of the pages on your SBI site by typing http://www.your-domain-here.com/urllist.txt into your browser. (Thanks to Diane Roshon for this tip.) Note: This list often does not contain pages that are NoIndexed or blocked by your robots.txt file. Make sure to review the list for missing pages. You can also make a copy of your SBI site and save it to your computer by using Httrack (PC) or SiteSucker (Mac). Should I use pages or posts on WordPress? If your informational content is contained in pages instead of posts, you will also want to install the RSS includes Pages plugin so your pages go out on your feed. My Recommendation: If you move your site to WordPress, I recommend getting rid of the .html extensions and going full WP. That means no html extension on pages or the post permalinks. Use pages for the home and utility-type pages, then posts for the rest of your site.The exception is you might want to create pages for your money-making or affiliate pages… but you don’t have to. I created posts with my money-making pages so they are in my RSS feed. Then I link to them liberally. Changing over to the WordPress format does require using 301 redirects to reroute all of your links to the new site. If you don’t know how, contact me. I offer this service for a small fee. Or see my article, Redirect an HTML Site to WordPress for detailed help. 4. Finished converting pages? Test, test, test! Testing is probably the most overlooked step in the moving process. Don’t skip it! Test your links, scripts, design elements, contact forms, everything. You do not want to transfer your domain only to find out the new site doesn’t work. If your site is your business website, this can be devastating to your income. Make sure you did everything right before making the move official. Once the site is fully-functional and your email is set up, contact SBI support to unlock your domain. Try to put in your request to SBI support on a weekday even if you are waiting to do the transfer over the weekend. Support has longer response times on the weekend. You will need your original order number for the domain so make sure to have it ready when you contact support. If you built your site on a temporary URL, you need to update the URLs before the site goes live. This should be done right before you change the nameservers so there is a smooth transition. NOTE: Skip this step if you built your site on a NEW domain. This is only for updating URLs from a temporary or alternate domain. First, install the Velvet Blues plugin. Follow the instructions on the plugin site to update the URLs in your page and post content. You may have to manually change the links, including image links, in your sidebar widgets. I’ve found that most plugins do not consistently correct those links. Finally, go to Settings > General and change the WordPress Address (URL) and the Site Address (URL) to the new domain then click Save Changes. Once you do this, you will most likely be kicked out of the site. Don’t worry, this is because you can no longer access the site through the temporary URL. It is normal. Immediately go to step 7. For the first step in the transfer process, transfer the nameservers only. This protects you if you have a disaster at the other end because you can easily change the nameservers back to SBI, fix the problem, then try again. The nameserver settings you use depend on your host. They are often included in the Welcome email you received that included your cPanel username and password. You can also find the information in your cPanel or from technical support at your new host. Usually nameservers switch within an hour but it can take up to 48 hours for the name servers to fully propagate across the internet. If your new site looks a lot different from the old one, you will be able to see when the nameservers switch over in your area. Tip: If you don’t see the new site, clear your browser’s cache. You may also need to flush your local DNS. On a PC, close your browser then in Windows, click Start > Run. Type ipconfig /flushdns into the box, then click OK.
Once the nameservers have fully propagated, check the website to make sure everything is working as expected. Don’t forget to make sure your email is working, too! After 48 hours AND if everything is working, then and only then should you transfer your domain name to your new host. Keep in mind that you do not have to transfer your domain name right away. You can leave it at SiteSell until about a month before it expires. Once the domain name has transferred, it is best to wait another 48 hours before you cancel your SBI hosting so the domain transfer has a chance to fully propagate. There is no hurry to cancel if you still have time left on your subscription. I hope this overview this helps. Moving a large website is a lot of work but it can be done. Make sure to allow enough time to do things right. You put a lot of work into your site… don’t ruin it by being in a hurry to move. Have more questions? Read the SBI to WordPress Site Migration FAQ. If you get stuck or need technical help, click here to order a consultation. Do you have comments or questions about moving a site from SBI? Please leave your comments below! How to Sign up for HostGator Web Hosting Should I Move my Website from SBI? Is SBI Right for Your Local Business Website? Thanks for a great article! I came looking for a way to transfer my SBI domain but your article kind of brushed over that (item 8), could you possibly explain in more detail how to transfer an expiring domain name from SBI to say GoDaddy? Important: Make sure the email address on your SBI account and domain registration are not using the domain you are transferring. Use an alternate email address. You will need to respond to several emails during the process so any email addresses using that domain name will be unavailable. SBI requires that the email addresses match. Keep in mind that if you need to change any of your domain registration information, it can take up to 24-48 hours for it to show up in WhoIs. Once you verify that your email address is correct, the next step to transfer the domain from SBI is to contact support to have them unlock it. Once your domain is unlocked, you initiate the transfer using your GoDaddy account. 2. Under All Products, select Domains > Transfer Domain. 3. Fill in your domain information then click Go. You will be taken through the process of paying for the domain transfer. This will initiate the process. You must respond to the emails you get from GoDaddy and TuCows to approve the transfers. The first step to transfer you domain from SBI is to contact support to have them unlock your domain. Once your domain is unlocked, you initiate the transfer using your GoDaddy account. I hope that helps! It sounds more complicated and time consuming than it is. If you babysit the process and submit the approvals right away, the transfer can complete in one day instead of five. This is the clearest instruction for transferring SBI to WP I’ve seen. Thanks for writing it. I have a question. I’m paying for my SBI subscription by the month. You said you can leave your domain name on SBI until about a month before it expires. Can my paying by the month be detrimental to transferring? Thanks! Paying monthly doesn’t make any difference to how the transfers are handled. SiteSell still registers domain names one year at a time. You don’t have wait to transfer your domain name to a new registrar if you don’t want to. You can transfer it whenever you want just as long as it has been at least 60 days since it was registered or transferred. Thank you so much for the wonderful information on your site. I have a question and I hope you can help me with this …. please. If I do an add on domain for my site from SBI to BlueHost, will my site become inactive? I want to work on transferring the content manually page-by-page from SBI to WordPress, but don’t want any down time and I am afraid that if I do an add on domain that my site will sit inactive and that I will lose whatever little income I have coming in and traffic. I just don’t know how else to have access to WordPress with my SBI site without doing an add on domain via BlueHost. Any help you can give me with this is greatly appreciated. Your SBI site will be live until you change the nameservers through your domain management panel from SBI. Great article, but I’m still too scared to do this myself. I need help. How can I contact you for prices? Thanks. Thanks for all the useful information. My SBI site is only in the beginning stages and very, very small (four pages). Do I really need to transfer pages or can I just start over in WordPress? Thanks for your help. I have a similar question to Ginger. I have an SBI site with about 60 pages. I want to use the same content but under a different domain name in WordPress. Can I just rebuild my pages in WordPress, page by page (I have to redo all the watermarks on the pictures to reflect the new domain’s name anyway). I haven’t started to monetize the site yet so its no great loss, other than my time spent to redo the pages. In short, its not a transfer of a domain or site but rather a creation of a new domain with the content from the old. Do I have to put a no follow link on all my pages in SBI before I publish the new pages on my new domain? This is actually the easiest scenario for moving content…using a new domain name. You won’t have to use a temporary URL or search and replace links and image file names before going live. If you don’t want the new content getting indexed before you cancel your SBI subscription you can use a maintenance mode plugin. Only logged in users can see the site when the plugin is active. When finished building the new site, you will need to 301 redirect the old domain to the new one. I’m not sure if you can do that with the Move It module since I’ve never used it before. If you can’t use Move It, you will have to transfer the domain to another registrar before you can 301 redirect it. Thanks for you quick and detailed reply. I really appreciate it. Why would I need to use a 301 redirect if I am not transferring the domain? I will be building a completely new site with a new domain name. The two sites (the SBI site and my new WP site) will have nothing to do with each other. Most of the titles will be changed to better optimize them and to fit more in line with my new site concept. For example, my SBI site is http://www.Hungarian-Cuisine.com. Its a recipe site. My new WP site will be http://www.flavourholic.com. I will rewrite the recipes to focus more on my new site concept, and add other recipes to demonstrate that you can make any recipe flavorful and how different cultures have their own flavor base. In short, I want to close down my Hungarian-Cuisine.com site completely and not quite sure how to do it. I thought you were going to use the same exact content but change the domain name. If the sites are not the same then you don’t have to use 301 redirects. The reason you use redirects is to keep from losing traffic when changing domain or page names. This is Ginger again (the girl with the very small SBI site). #1 Which comes first..building a new site or getting the host? SBI is holding my domain name and hosting my site, but I want to change hosts to Hostgator. Should I build a new site on WordPress first then get a new host or get the host then build? #2 According to how you answered Shirley’s question let me see if I understand. If I build the new site first before I get a new host, the new site I build in WordPress will not be live until I change name servers (get a new host) plus the temporary URL to work on my new site is provided by WordPress before it is live right? Off topic questions. What is the least expensive but reliable paid WordPress theme you reccommend? What is your opinion of Wix.com? If you want to build your site online (as opposed to locally on your own computer which is kind of technical to set up), you will need to order hosting first. Then you install WordPress and start building your site. I think you might misunderstand what WordPress is. In my articles, I’m referring to WordPress.org which is software you install on your web hosting account. The other WordPress is wordpress.com. That is something completely different…it is hosted WordPress and only intended for people who run personal blogs. That is not what you use when you move your site from SBI. So to answer #2, when you install WordPress on your hosting account, no it won’t be live until the nameservers are switched. So you have to access WordPress through a temporary URL. Here is the article from HostGator that explains it: http://support.hostgator.com/articles/hosting-guide/lets-get-started/temporary-url. If you need any help getting WordPress installed on your hosting account, that is a service I provide. Some people prefer to let me handle all the technical set up then they can just start right in moving their content. It does take time to learn all of the technical aspects of running a website. Hi – I am a little confused about the process changing nameservers and domain name, and how I can build a new site without having that domain name. Can you please explain what I’m missing? IF your domain name is in use, you need to recreate the site on your new host using a temporary URL. The URL is often based on your hosting account IP address. For instance, on Hostgator, this is a common temporary domain format: 111.22.33.4/~cpanelusername/. It can be a bit involved to set up but many hosts will do this for you for free. Try contacting tech support and tell them you need to set up a temporary domain for your new WP site to see if they will do it for you. If not, I do provide this service. When you are finished recreating your site, you change the nameservers at SBI to point to your new host. If you do want to transfer your domain name away from SBI, wait a few days after changing the nameservers. You can usually find the nameservers for your new hosting account in your welcome email, cpanel, or you can always contact tech support. Thanks so much for this super informative site. I’ve been using SBI! for years and I’ve certainly made a lot of mistakes since 2006. My site was hit hard by Panda in 2011 and then again by Penguin. I’m moving the site over to WordPress which I like for the simplicity and ease of getting around. 1. What about links pointing to your site. If I want to keep all the links that are pointing to my site over on SBI! and make sure they are still pointing to my new domain name and WordPress site, do I have to use MoveIt! to do this? 2. I already copied and pasted each page into my new WordPress site but copied them into posts vs pages. Does it matter and what’s the difference? I can’t thank you enough for your really informative and helpful site Sue! Thanks for visiting, and thanks for your kind words! I’m glad this info has been a help. If you are keeping the same domain name, when you change the nameservers to point to your new webhost, the traffic will naturally go to the new site. If you are changing domain names, the process is a bit more involved (change nameservers, set up addon domain at new webhost using old SBI domain, redirect that domain to the new). I honestly don’t know if you can use MoveIt to redirect your SBI domain to an external domain. That is something I need to research unless someone else knows the answer to that. Pages vs. Posts can be a complicated discussion! My recommendation is to use pages for home, about, and other utility pages, and any pages that need to be viewed in a specific order (such as tutorials), and possibly your high dollar money pages. Anything else usually works okay as a post. Thanks so much for the response Sue. I really appreciate it! One last question though. Taking MoveIt! out of the equation; how do I make sure that any links pointing to my site are moved. I’m actually changing the domain name and I want to make sure that the links go with the new domain. Is it just a matter of redirecting them? I’ll check out the article about the pages and posts over on WordPress codex. Thanks for sharing that as well. Yes, you redirect the old domain to the new. The instructions I’m writing to do this from SBI really need to be in their own tutorial. I’ll make a note here when I post it and I’ll also send a note to my list. I’m planning on doing something with my site similar to what Valerie did, but I just want to make sure I have this right before I start. 🙂 I am going to move my content (copy/paste etc.) to a WordPress site with a different domain name. Should I delete the SBI pages from the old site as I reproduce them on the new site? Also, if I redirect the old domain name to the new one, then any links out there will send visitors to the new site, right? Thank you for all your help!! The info you provided is invaluable! No, don’t delete pages from the SBI site as you are building the new site. You will lose your traffic. The best thing to do is use a maintenance mode plugin to keep prying eyes out of the new site until it is finished. You can also go to Settings > Reading in your WordPress dashboard then select “Discourage search engines from indexing this site.” That will noIndex the entire site. When you are completely finished with the new site, remove the noIndex and maintenance mode screen. Then redirect your old domain name to the new site. You want to use a permanent 301 wildcard redirect. A wildcard redirect means that each page is redirected to the same page at the new domain. This is the only correct way to redirect so you don’t lose your traffic. NOTE: You have to transfer the domain from SBI to another registrar to set up that kind of redirect, you can’t do it on SBI. It will take Google several days to figure out your new site can be indexed so don’t worry about both sites being live during the time it takes to transfer the domain then set up the redirect. Thanks for supplying some great information on this website.. I just have 1 or 2 quick question about external links pointing to my domain. If I change all my pages from html to wordpress will they lose all link juice pointing into them? You recommend getting rid of the .html extension, if I do this, surely my website will lose a lot of search engine traffic. So an example would be.. So when someone searches for the keyword “page” and they click my old link they will be directed to a 404 page. Thank you for the information on these pages. I am now so confused. The reason being that I always pictured the site in its entirety. I like left hand nav, as this is easier (in my mind) to navigate and get your bearings from (I plan on 15 nav buttons). I have delayed building anything more (I have soo much content building up) as I was getting despondent. I would go and see something and it would be newsworthy… but It would also be evergreen (e.g. a review of performer which would follow his biography). Which Is why I was thinking of putting on an external blog. (so that I could simply let these posts reside in categories for that person and have one link from their biography page to their categories page). This would then mean maintaining two separate sites, which seems like a lot of extra work for the same effect. I do have a wordpress blog and I know that it is a whole lot easier and quicker to get something up than hassling with sitesell (although not necessarily better optimised). Then there is a problem if wanting to add a shop. I suppose that this would also have to be hosted somewhere else. I am soo stuck that I actually don’t want to add further content to sitesell as if I do move to wordpress it will be even more work to transfer. Agh, I feel better now… needed that rant. I’m sorry you are having trouble making a decision, although I can certainly understand your predicament. This is one of the biggest problems with SBI… if you need to add a blog, shop, forum or anything else, it can get very expensive to add the cost of 3rd party tools to the $299/year fee for SBI. And that doesn’t include the extra work of running multiple sites instead of one. It is a hassle to move content from SBI to WordPress so you are right, the less content you have to move the better. Because you are not adding content regularly, it is obvious SBI is holding you back. When a business tool is no longer meeting your needs, it is time to switch tools. If I were in your shoes (which I have been), I would move the site to WordPress so you can run your blog and shop all on the same site. Less hassle, less work, less cost. Did you know there are SEO benefits to running your blog on the main site instead of a subdomain? Another reason to move the site instead of using Infinit. I’m not sure if the left-hand navigation is a reason you haven’t made the switch. But you can easily create right- or left-hand navigation in WordPress by building a custom menu then inserting it into a sidebar widget. thank you for your response. I was very surprised, but kind of hoping you would reply. Your comment about not adding content as being held back rings kind of true. I have been with some world famous magicians in the last few months and haven’t even added this stuff… very slack. Thank you for helping my mind clarify this. Decision made… no more sitesell (yay I wont have to read all those pages and pages of forum posts/ HQs etc to find out how to do something- and to actually do anything- this was also bugging me). I actually feel relieved. Now, I am off to go and ” play” with an escapologist showing his shackles. And will start reading up on your info on how to transfer. You’re welcome, Kenny! I’m glad to help. I don’t always recommend leaving SBI but in your case, it really sounds like the best plan to move your business forward. Good luck! If you need my tech support services, please send me a note through my contact form and we can discuss your project. Hey Sue, I am one of the members at AJ’s UMT Facebook group. I’ve bought the Daily Dish theme and am using InstantWP to design the new site. I have the homepage almost done with, but my images and links are all local url’s….like 123.45.6789/wordpress/image.png or something like that. My SBI site has 200+ pages. Am I going to have to completely change all the url’s again once I switch name servers? I just want to be going about this the right way. I don’t have a new host yet. Pretty sure I want Hostgator. I read something on this page that you can build the site thru there? Or do I build the entire site on InstantWP, then buy a host and it all magically changes all the image links and stuff to the new server? kinda confused at the order of things I should be doing. It is fine to build the site locally, and yes, the links will all use the local URL. I’ve not used InstantWP but it looks like they have instructions for deploying the site. Usually, if you use software to deploy it on your hosting account, the URLs are changed during the process. After the site is switched, if there are URLs that weren’t changed, use the Velvet Blues plugin to change the URLs in bulk. Just make 100% sure there are no typos in the URLs before you press the button! You can wait to buy hosting until you are almost finished with the local site. I now recommend SiteGround instead of HostGator, although, HG is still an okay host. But with a site the size of yours, you are better off buying a plan on a higher quality webhost so you don’t have speed issues or downtime. I use the SiteGround GoGeek plan for my site. I’m ready! I just purchased the GoGeek plan on Siteground. My site is done locally on InstantWP. Do I now contact SBI or do i install WordPress on Siteground first? I’m nervous about doing this right. After you have the site files uploaded and the database migrated, change the nameservers at SiteSell to the Siteground nameservers the gave you when you signed up. (These are usually included in a welcome email but you can also find them in cPanel.) Once the nameservers flip over, you will be able to access the site and test, test, test! For a smooth transition, wait a few days after changing the nameservers before transferring the domain name. Once the domain transfer is started, it is safe to cancel your SBI account.